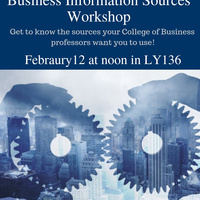 Get to know the sources of information your College of Business professors want you to use in your assignments! This workshop identifies the library's company, business, and industry information sources that are available. Recommended for any College of Business major or minor. Register at tinyurl.com/faulib-sp2019 or see our calendar of other workshops, tours, and events. Faculty and Instructors: assign these as extra credit! Certificates of Completion are provided to students by request. To arrange a library session for your class or to request a research consultation, visit tinyurl.com/faulib-instruction, email lyilis@fau.edu, or call (561) 297-4318.